Postal address: H-1117 Budapest, Pázmány Péter sétány 1/A. Multidecadal trends of mean basal area increments of beech from three sites and four different stand ages were investigated in Western and Northern Hungary. Regardless location and age, our findings show a slowdown in growth or even significant increment decrease for the past 30-40 years. Although the phenomenon is connected to unfavorable changes of climatic conditions, no clear linear relationship can be detected between the decadal trends of increments and the widely used forest aridity indices. 2. Führer E. 2010: A fák növekedése és a klíma. Klíma 21-füzetek, 61: 98-107. 3. Führer, E.; Horváth, L.; Jagodics, A.; Machon, A. and Szabados, I. 2011: Application of new aridity index in Hungarian forestry practice. Időjárás, 115: 205-216. 4. Führer, E.; Edelényi, M.; Horváth, L.; Jagodics, A.; Jereb, L.; Kern, Z.; Móring, A.; Szabados, I. and Pödör, Z. 2016: Effect of weather conditions on annual and intra-annual basal area increments of a beech stand in Sopron Mountains in Hungary. Időjárás, 120 (2): 127-161. 10. Kázmér, M. and Grynaeus, A. 2003: The Budapest Tree-Ring Laboratory. Association for Tree-Ring Research, Newsletter 1: 5-6. Führer E. 2010: A fák növekedése és a klíma. Klíma 21-füzetek, 61: 98-107. Führer, E.; Horváth, L.; Jagodics, A.; Machon, A. and Szabados, I. 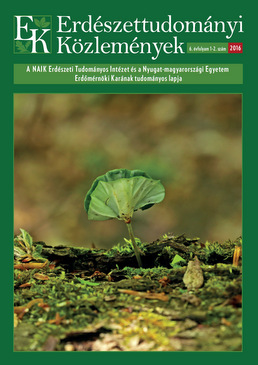 2011: Application of new aridity index in Hungarian forestry practice. Időjárás, 115: 205-216. Führer, E.; Edelényi, M.; Horváth, L.; Jagodics, A.; Jereb, L.; Kern, Z.; Móring, A.; Szabados, I. and Pödör, Z. 2016: Effect of weather conditions on annual and intra-annual basal area increments of a beech stand in Sopron Mountains in Hungary. Időjárás, 120 (2): 127-161. Kázmér, M. and Grynaeus, A. 2003: The Budapest Tree-Ring Laboratory. Association for Tree-Ring Research, Newsletter 1: 5-6. For non-commercial purposes, let others distribute and copy the article, and include in a collective work, as long as they cite the author(s) and the journal, and provided they do not alter or modify the article. 1. Hirka, A., Pödör, Z., Garamszegi, B. & Csóka, Gy. (2018): 50 years trends of the forest drought damage in Hungary (1962-2011). Bulletin of Forestry Science, 8(1): 11-25. 2. Gálos, B. & Somogyi, Z. (2017): New climate scenarios – smaller drought risk for European beech?. Bulletin of Forestry Science, 7(2): 85-98. 3. Führer, E., Edelényi, M., Jagodics, A., Jereb, L., Horváth, L., Kern, Z., Móring, A., Szabados, I. & Pödör, Z. (2016): Effect of weather conditions on the annual basal area increment of a beech stand of old age. Bulletin of Forestry Science, 6(1): 61-78. 4. Janik, G., Hirka, A., Koltay, A., Juhász, J. & Csóka, Gy. (2016): 50 years biotic damage in the Hungarian beech forests. Bulletin of Forestry Science, 6(1): 45-60. 5. Csépányi, P. (2013): Economic analysis of the continuous cover forest management in beech stands in comparison to the traditional rotation system. Bulletin of Forestry Science, 3(1): 111-124. 6. Schiberna, E., Lett, B. & Juhász, I. (2012): Theoretical considerations of evaluating economics of continuous cover forestry. Bulletin of Forestry Science, 2(1): 7-19. 7. Führer, E., Marosi, Gy., Jagodics, A. & Juhász, I. (2011): A possible effect of climate change in forest management. Bulletin of Forestry Science, 1(1): 17-28. Hirka, A., Pödör, Z., Garamszegi, B. & Csóka, Gy. (2018): 50 years trends of the forest drought damage in Hungary (1962-2011). Bulletin of Forestry Science, 8(1): 11-25. Gálos, B. & Somogyi, Z. (2017): New climate scenarios – smaller drought risk for European beech?. Bulletin of Forestry Science, 7(2): 85-98. Führer, E., Edelényi, M., Jagodics, A., Jereb, L., Horváth, L., Kern, Z., Móring, A., Szabados, I. & Pödör, Z. (2016): Effect of weather conditions on the annual basal area increment of a beech stand of old age. Bulletin of Forestry Science, 6(1): 61-78. Janik, G., Hirka, A., Koltay, A., Juhász, J. & Csóka, Gy. (2016): 50 years biotic damage in the Hungarian beech forests. Bulletin of Forestry Science, 6(1): 45-60. Csépányi, P. (2013): Economic analysis of the continuous cover forest management in beech stands in comparison to the traditional rotation system. Bulletin of Forestry Science, 3(1): 111-124. Schiberna, E., Lett, B. & Juhász, I. (2012): Theoretical considerations of evaluating economics of continuous cover forestry. Bulletin of Forestry Science, 2(1): 7-19. Führer, E., Marosi, Gy., Jagodics, A. & Juhász, I. (2011): A possible effect of climate change in forest management. Bulletin of Forestry Science, 1(1): 17-28. 1. Berki, I., Móricz, N., Rasztovits, E., Gulyás, K., Garamszegi, B., Horváth, A., Balázs, P. & Lakatos, B. (2018): Mortality and accelerating growth in sessile oak sites. Bulletin of Forestry Science, 8(1): 119-130. 2. Garamszegi, B., Nagy-Khell, M., Farkas, M. & Nagy, L. (2018): Impact of weather conditions on the interannual growth characteristics of alder and oak stands with improved groundwater-management. Bulletin of Forestry Science, 8(2): 9-16. Berki, I., Móricz, N., Rasztovits, E., Gulyás, K., Garamszegi, B., Horváth, A., Balázs, P. & Lakatos, B. (2018): Mortality and accelerating growth in sessile oak sites. Bulletin of Forestry Science, 8(1): 119-130. Garamszegi, B., Nagy-Khell, M., Farkas, M. & Nagy, L. (2018): Impact of weather conditions on the interannual growth characteristics of alder and oak stands with improved groundwater-management. Bulletin of Forestry Science, 8(2): 9-16. * Automatically generated recommendations based on the occurrence of keywords given by authors in the titles and abstracts of other articles. For more detailed search please use the manual search.